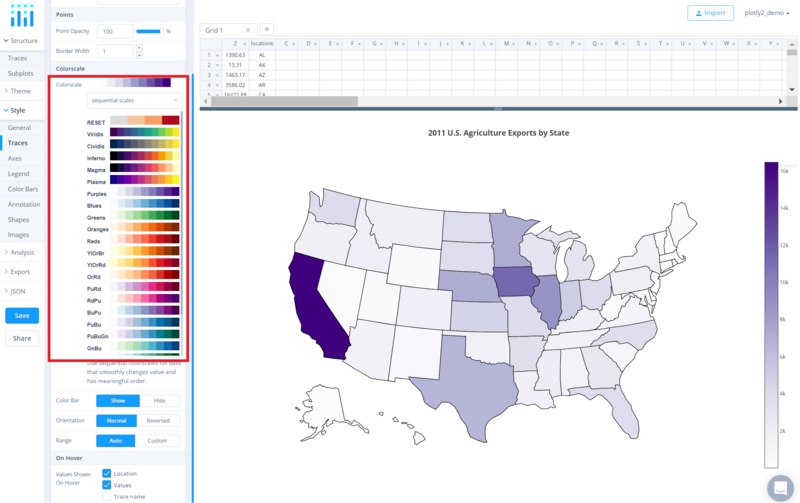 A map that uses differences in coloring within predefined areas to indicate the average values of a variable within those areas. 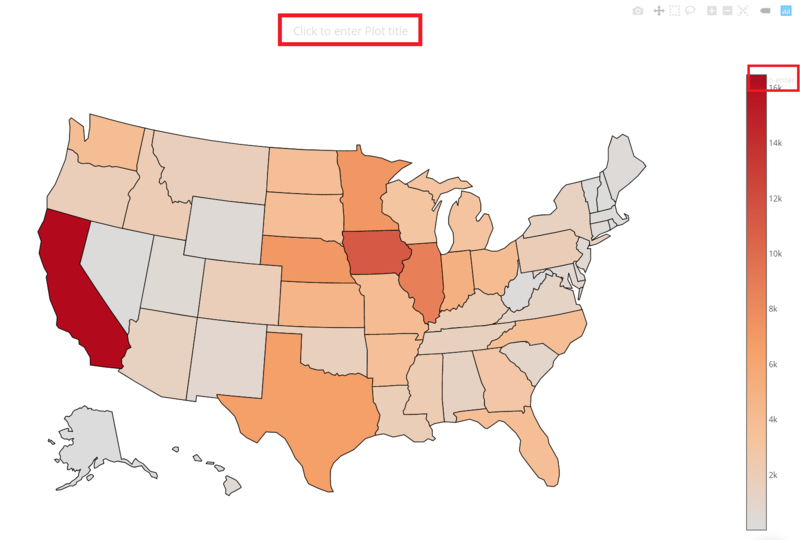 A choropleth map provides an easy way to visualize how a measurement varies across a geographic area or it shows the level of variability within a region. After adding data, go to the 'Traces' section under the 'Structure' menu on the left-hand side. 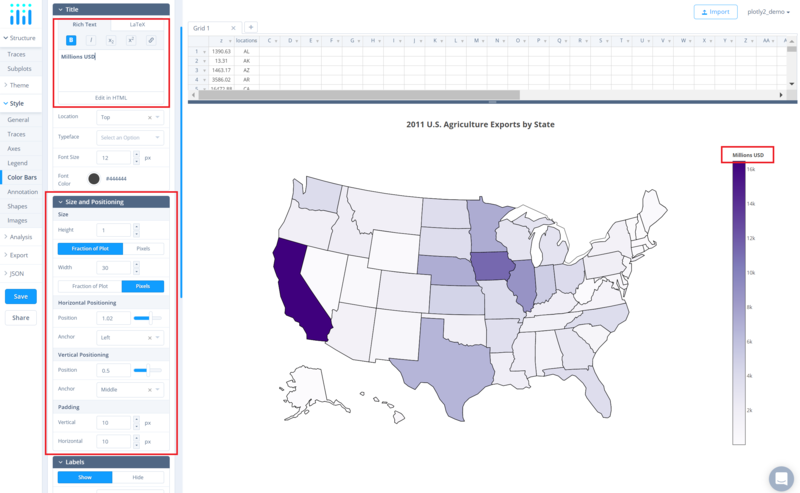 Choose the 'Type' of trace, then choose 'Choropleth' under 'Maps' chart type. Now, specify the coordinates in terms of location IDs (i.e., abbrevations). Note that the coordinates correspond to the centroid of each given location. 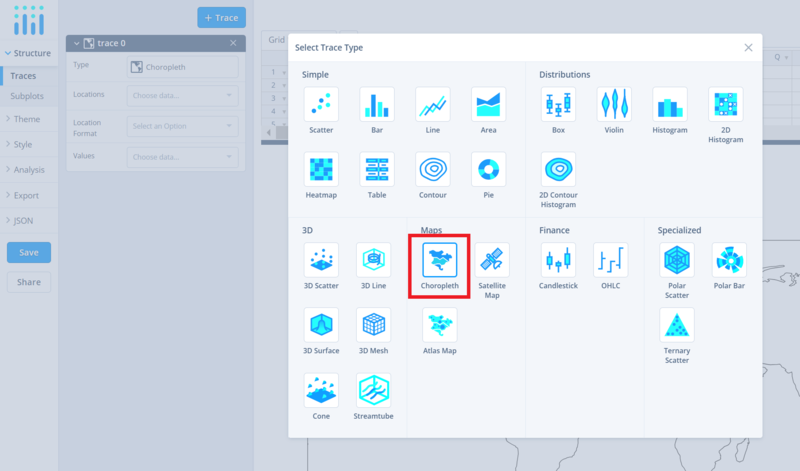 The attribute 'Location Format' determines the set of locations used to match entries in 'Location' to regions of the map. Then, specify the color values from the dropdown menu next to the attribute 'Values'. 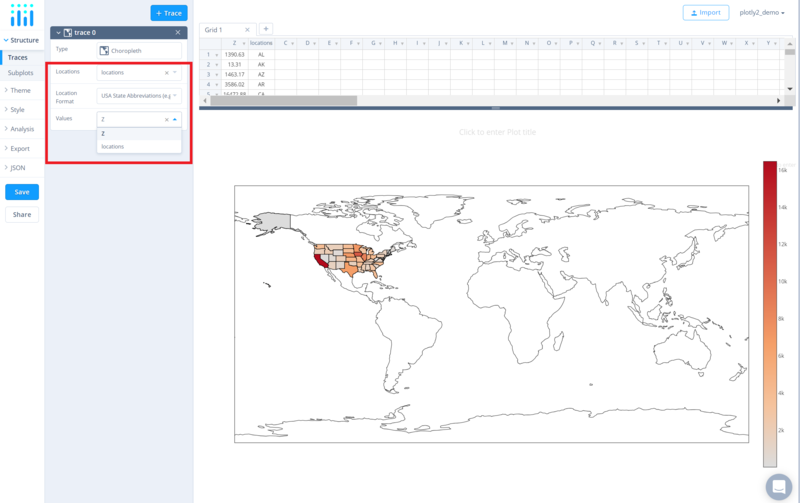 The data used in this example contains data points only for the USA, hence the points are populated around the USA region. 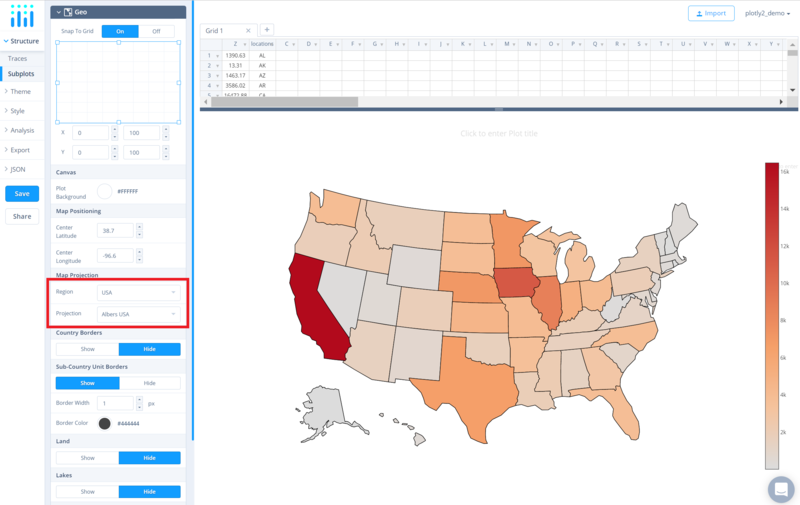 Note that, at the moment, the Chart Studio supports only country location IDs for the World map and is limited to the USA region for state location IDs. 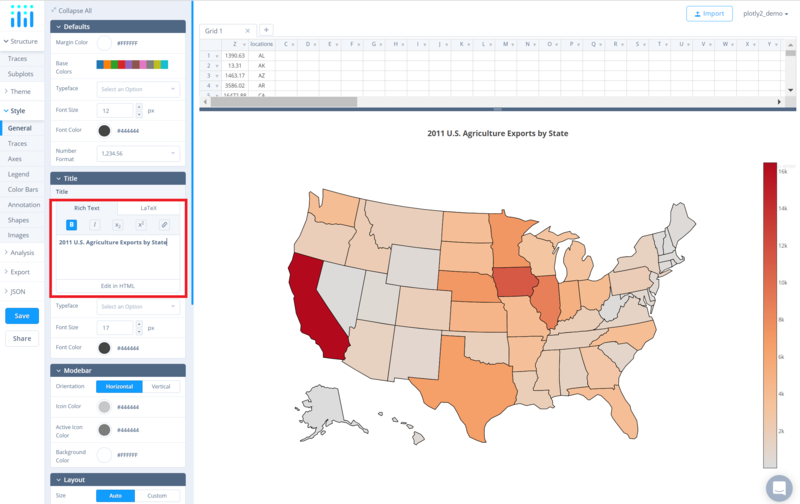 To change the view to just the USA, go to the 'Subplots' section under the 'Structure' menu and select 'USA' from the dropdown next to the attribute 'Region' under the property 'Map Projection'. This simply changes the region to the USA as opposed to a global map. Below, the 'Projection' dropdown will automatically default to 'Albers USA' then. Use the 'General' section under the 'Style' menu to set the plot title, and other layout properties. Another approach is to click and then enter the title directly on the plot interface. The same can be done for the color bar title. Use the 'Traces' section under the 'Style' menu to change the properties of the trace. To change the colorscale of the traces, click on the current colorscale next to the attribute 'Colorscale' in the same section. This will display a dropdown menu with the available colorscale types and their corresponding preset colorscales. Choose the desired colorscale. To reverse the chosen colorscale, set the 'Orientation' attribute to 'Reversed', as seen below. Additionally, to show/hide the color bar, set the desired option next to the attribute 'Color Bar'. Use the 'Color Bar' section under the 'Style' menu to change the size and positioning of the color bar or to set the color bar title.